High-fived a guy wearing a t-shirt with the University of Texas (my alma mater) Longhorn logo on the front. Traded Big D stories with a young JAG officer who was originally from Dallas (my adopted hometown). Learned when Jack Wilshere is going to get his act together from a fellow Gooner wearing his Arsenal FC (my favorite team) game jersey. And while any of these could have easily been the highlight of a typical day, this was not a typical day. This was the Virginia Craft Brewers Fest, and we were there to discover, sample, and recognize the best the state has to offer in craft beer. More than 40 breweries submitted 222 different beers into the competition vying for gold, silver and bronze medals in 14 categories. 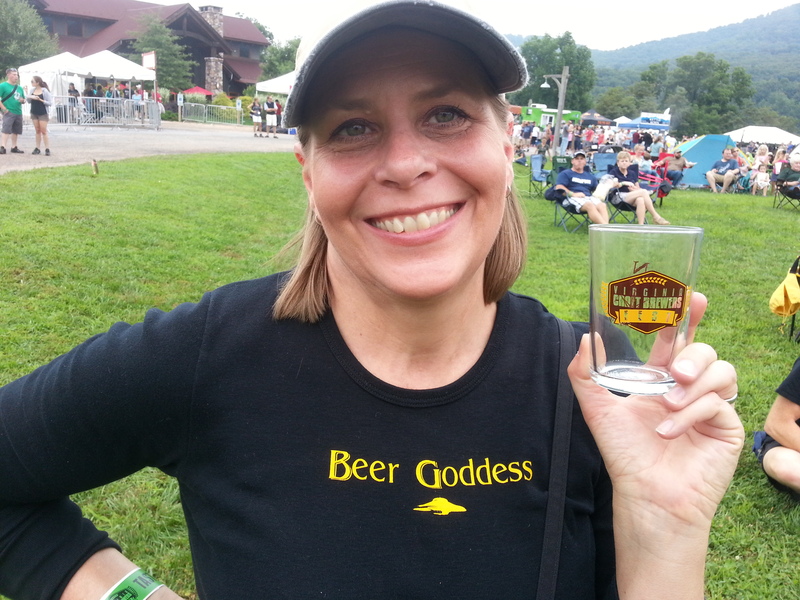 Hooked up with this Beer Goddess at the Virginia Craft Brewers Fest and took her home with me that night … which is OK because she’s my wife. I would be remiss if I failed to mention that Three Brothers Brewing Co., the craft brewery in my new hometown of Harrisonburg, won gold in the Imperial IPA category for their tasty delight named The Admiral. Interesting thing about The Admiral. While the Beer Goddess and I are on opposite sides of the beer continuum, or beertinuum, from one another, we each have a completely different response to The Admiral. She’s all about hop bite, and wants her IPAs to pinch her in the back of the throat. I, on the other hand, am malty and sweet (as my siblings would attest) and prefer a full mouth feel of velvety goodness. Where we do agree is that The Admiral does the latter more than the former, which makes it possibly the only IPA that I can drink. Perhaps it’s so much IPA that it comes back around full circle to something my palate finds delicious. You know, sort of how Paris Hilton is so skanky she’s kinda hot. So we must salute The Admiral, and Three Brothers, for winning what this beer purist believes is the pinnacle category of craft beer. Gold — Hoptopus Double IPA (Beach Brewing Co.) — My IPA swilling friend says this year-round offering is the perfect IPA in that it’s heavy on the hops (108 IBUs) and full of flavor. I’ll take her word for it. Silver — King of Hop Imperial IPA (Starr Hill) — The everyday IPA by this brewer is not one that the IPA drinkers I know particularly care for. So it was with some hesitancy that my designated IPA taster tried this brew. Boy was she surprised. A nice citrus flavor helped balance this hoppy offering. If the King of Hop was easily found, it could be the everyday IPA in our household. Bronze — Bucktooth IPA (Rusty Beaver Brewery) — I’m told this one was clearly made with love. I guess I have no choice but to believe that. The Goddess says it has lots of flower in the nose and a big hop bite in the finish. Honorable Mention — Expedition IPA (Adventure Brewing Co.) — Sometimes it’s hard to pick just three. Therefore the Expedition IPA gets Bronze 1A for being a mellow, but quality IPA. Notes of white wine in the taste. Gold — Wicked Nymph Imperial Stout (Adventure Brewing Co.) – Holy crap this was a great beer. Smooth with extremely slight hints of chocolate but with a wild stout kick. I know why they chose to put “wicked” in the name. Silver — Pumpkin Ale (Aleworks Brewing Co.) – I love the fall season when we move away from the summer ales and start getting more bocks, Oktoberfests, and pumpkin flavored beers. This Pumpkin Ale was a great start with enough ale attitude that tamped down any chance to have the pumpkin flavor overpower the maltiness of the beer. It was like pumpkin pie in a glass. Bronze — Gingerbread Stout (Hardywood Park) – Yum yum yum yum yum. An excellent balance of gingerbread and boldness from the imperial stout brewing process. Lots of spice flavors in the mouth including cinnamon and ginger. It’s beginning to taste a lot like Christmas. Honorable Mention — Virginia Vulgarian Bourbon Bock (Strangeways Brewing) – As those of you who have read my blog before know, I’m usually reluctant to recommend the rum and bourbon flavored beers. But this Virginia Vulgarian Bourbon Bock was an eye-opener. It was malty in the front of the mouth, and then had a delayed liquor kick at the end. Everyone who tried it could only say “Wow.” And at only 6.6 ABV, I think I’ll have another. After a great day of tasting quality beer, the Beer Goddess and I took off for home, stopping along the way at Blue Mountain Brewery for a final pint and a bite. It was here that I was able to drop a little water on my burger drought with the brewpub’s special, the aptly named Hangover Burger. This tasty concoction featured an almost-properly cooked burger (it was closer to medium than medium rare) with the usual lettuce, onion, and tomato. But this burger special came with a fried egg (over easy) and bacon on top. And while it might not sound terribly appetizing, and it certainly wasn’t a photogenic meal because I tried several times, it was yum to the yumth degree. So here’s to the best of Virginia Craft Brewers, along with a special salute to The Admiral, as well as a tip of the hat to the best burger I’ve had in months. You all have plenty of reasons to be proud. This entry was posted in Beer related and tagged awards, craft beer, Virginia, Virginia Craft Brewers Fest. I’ve been to a lot of concerts in my life. Started in 1978 when my parents were foolish enough to let me attend the KISS concert in Kansas City. Of course, they were the ones who fostered a love of music in me, so they only have themselves to blame. Between that first show 36 years ago and the one I went to last week, I also worked at a trade magazine covering the concert touring industry. So I can’t begin to accurately count the number of concerts I’ve seen. Linkin Park shares a craft beer with me for my birthday last week at Jiffy Lube Live in NOVA. 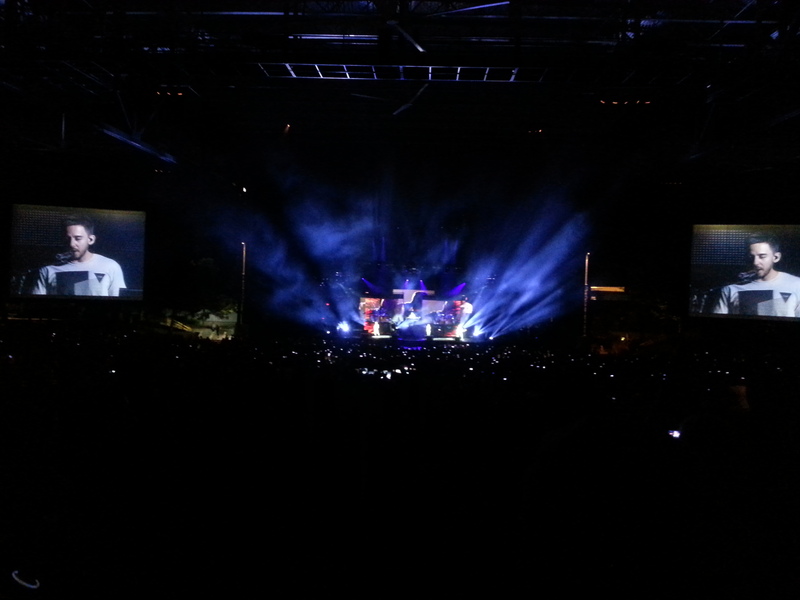 So why were craft beers available at a Linkin Park concert in suburban D.C.? Is it that Virginia is such a craft beer loving state that any public venue must now carry these carefully made mouth-watering delights in order to cater to public demands? Or is it that the craft beer revolution has taken hold across the entire United States of America, and craft beers are demanded by a beer-guzzling public coast-to-coast? Since moving to Virginia in 2013, I have first-hand knowledge that this is a craft beer friendly state. Not only was Harrisonburg, the college town in which I live, named best craft beer town in all of Appalachia, but there are four craft breweries within an hour’s drive — the previously mentioned Devil’s Backbone, as well as Blue Mountain Brewery, and Wild Wolf Brewing Company, and the hometown Three Brothers Brewing Co. On top of that, a fifth brewery is scheduled to open in the ‘Burg later this year, and I haven’t even mentioned all the others in nearby Charlottesville and throughout the rest of the state. But according to the Brewers Association, Virginia ranks 15th in total number of craft breweries, and only 30th in breweries per capita, with just 1 per 100,000 people. Then again, maybe the fact that connoisseurs of crafty concoctions are spread nationwide has contributed to the craft beer boom. The Brewers Association says there were 89 breweries in the United States in 1979, the year after former President Jimmy Cater signed the home brewers law, but by 2013, there were 2,416 breweries in operation (almost 400 more than just the year before), with 98 percent officially labeled craft breweries (which includes local breweries, microbreweries and brew pubs). While it sounds good that 98 percent of the U.S. breweries are of the craft variety, they have only 7.8 percent of the entire beer market, according to the BA. That means the big three — who shall remain nameless here — still have roughly 80 percent of all beer drinkers swilling their colored water, with imports making up the difference. 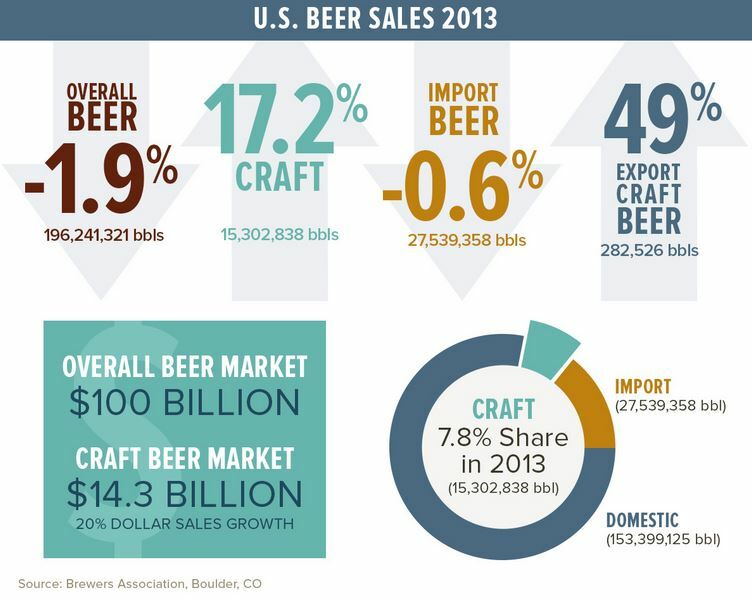 Still, the small gains by the craft beer industry have had an impact. Bloomberg news reported earlier this year that the acquisitions of Goose Island, Blue Moon, Lienenkugel, ShockTop, and ZiegenBock by the big three are in response to the inroads made by craft breweries, and at the expense of market share by Bud Light and Miller Lite, their top brands. So craft beers are a threat to the mass brewers, but aren’t taking market share as the big boys simply schlep out their versions of craft brews to unknowing consumers. What are we, the enlightened craft beer intelligentsia supposed to do? Drink more beer? Well, sure, that’s one option. But at some point we reach personal capacity. The better approach may be to introduce a friend who doesn’t drink good beer to the craft beers we know and love. For example, earlier this summer I was fortunate enough to be sitting in the Three Brothers taproom with some of the wife’s co-workers. The one immediately to my left said she didn’t know what to order because she was “more of a wine drinker.” My response: “Let’s each get a flight so we can taste several.” Over the next hour she and I tasted six different Three Brothers beers and I imparted as much knowledge about beer as I thought she could take. Turns out, she liked learning about it all, and definitely found out there were at least two styles of beer she liked, and two she definitely didn’t. Meanwhile, another co-worker sitting at the opposite end of the table had ordered a beer but wasn’t drinking it. When I asked why not she said it was because she didn’t like it (she’d ordered a session beer). I asked her what kinds of flavors she preferred, and after some probing, I recommended the Virginia Dark Ale — a black IPA that hits with plenty of roasted malt up front and finishes with a nice hoppy bite. “I don’t like dark beers,” she said after I’d made my suggestion. “Color has little-to-nothing to do with the flavor of the beer,” I replied with my auto-pilot response, and immediately got her a taste of the Dark Ale. Guess what? She loved it. So, that’s two converts to craft beer. Now it’s up to the rest of us to continue the effort so that we really do become a craft beer country. This entry was posted in Beer related and tagged Brewers Association, craft beer, Linkin Park. Just like most of the Western U.S., I’m in a drought. It’s not water that I’m missing, though, it’s the void of a really great burger that I’m feeling. I can’t remember the last time I had a delicious mound of ground round that was perfectly pink and placed between bountiful bread. OK, that was a lot of alliteration from an anxious author. But see what a dearth of burger goodness does to someone? I tried to solve my burger drought by flying to … wait for it … California. That’s right. I spent last weekend in San Francisco searching for a great burger. Well, it was actually a business trip. But who says one can’t be part of the other. The initial attempt came the first night I was there when I was joined at Thirsty Bear Brewing Company by friends Iman Naderi and Bob Fabrize. After a pint of the house beers – the Kozlov Stout for me and the Howard Street IPA for them – we each ordered the thirstyburger. I was diligent in pointing out to the waitron that mine should be put on the grill last since I ordered medium-rare, while my colleagues chose medium and medium-well. No burnt food for me, please. According to the menu, the thirstyburger was 100 percent grass-feed beef topped with hook’s five-year cheddar and a special garlic-tomato sauce as well as a garlic aioli. Mmm, garlic. Sounded promising. When mine showed up, the thick chunk of meat was closer to medium than medium-rare (probably was still cooking after it came off the grill, but a good cook should account for that). The burger overall was piled high with the standard lettuce-tomato-pickle toppings, while the brioche bread buns made it even taller. Looked promising. But as I worked my way through the mountain of a meal, I was not overwhelmed. The fact that the burger was cooked more than it should be was definitely a factor that negatively affected the taste. The double shot of garlic didn’t give it the bite I think it should have. And while the French bread was quite good, it made the filling in between almost disappear. I eventually removed the top half and just ate the burger with the bottom piece. If the meat had been a little bloodier, the garlic a little stronger, and the bread a little thinner, this would have been a great burger. Instead, it was B– effort. The stout, with some hints of roasted coffee and unsweetened chocolate, got a slightly higher grade of B. 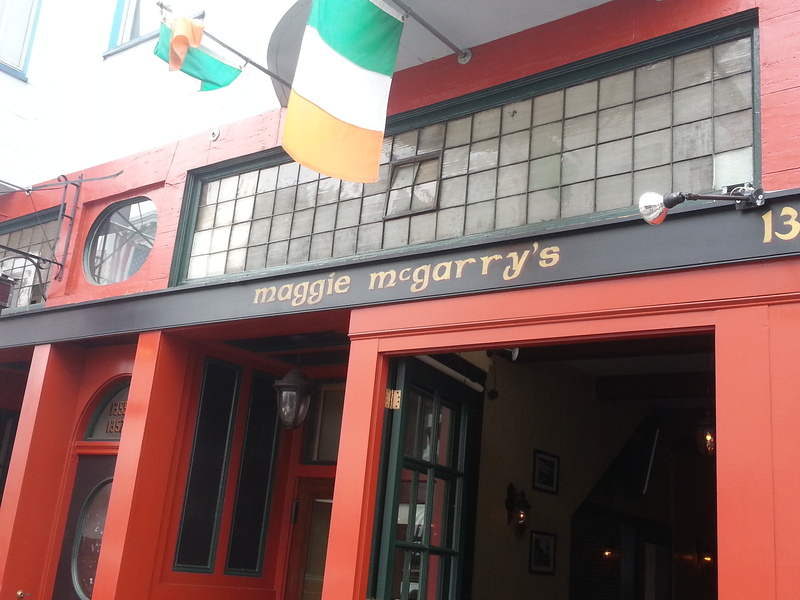 Got a nice Brekle’s Brown Ale by Anchor Brewing Co. at Maggie McGarry’s in S.F. while watching an Arsenal game. The burger drought extended the rest of the weekend as pizza and Persian were the dining choices made by my colleagues the next two nights. That was followed by an airport food lunch and an airplane food dinner. It seems I’m not lacking for air travel cuisine. Returning to the ‘Burg I attempted to remedy the situation by trying a restaurant on Thursday that my roommate insists makes good burgers. So off to Union Station we went, quickly finding a seat at the bar. Things started well when I tasted, and then ordered a pint, of the Jeffersons Reserve Bourbon Barrel Stout made by Bluegrass Brewing Company. Too often, the bourbon and rum barrel aged beers are overpowered by the bourbon and rum. Hey, if I want liquor, I’d order liquor. When I order beer, I want beer. And this stout was definitely the latter. The full-bodied, dark dark beer had a mocha coffee flavor that balanced nicely with the bourbon to create a smooth, partakeable brew. The burger, on the other hand, was a no-frills slab of meat covered with cheddar cheese and some onions (which I had to order as “extra” and became the most flavorful part of the experience). In spite of asking for it to be cooked medium rare, it came out medium-well. Certainly not a memorable burger. That said, I will go back to Union Station to try a burger off the full menu because the place has almost half a dozen from which to choose. Thinking back, now, I believe the last great burger I had was at Jack Brown’s in Harrisonburg sometime in March when we slogged our way through mountains of snow. 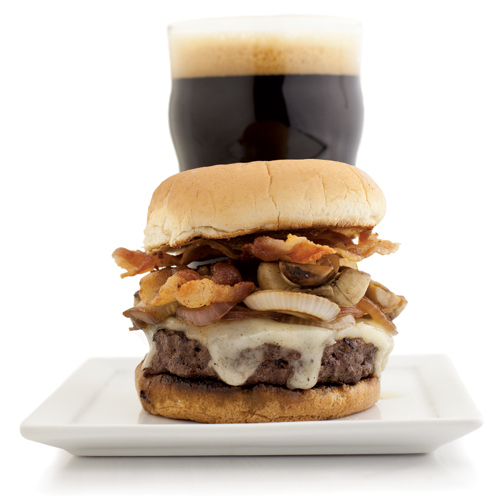 Perhaps that’s the key – make the quest a challenging one and the result is a better burger. If that’s the case, then I’d love to be in Hawaii right now. This entry was posted in Burger related.